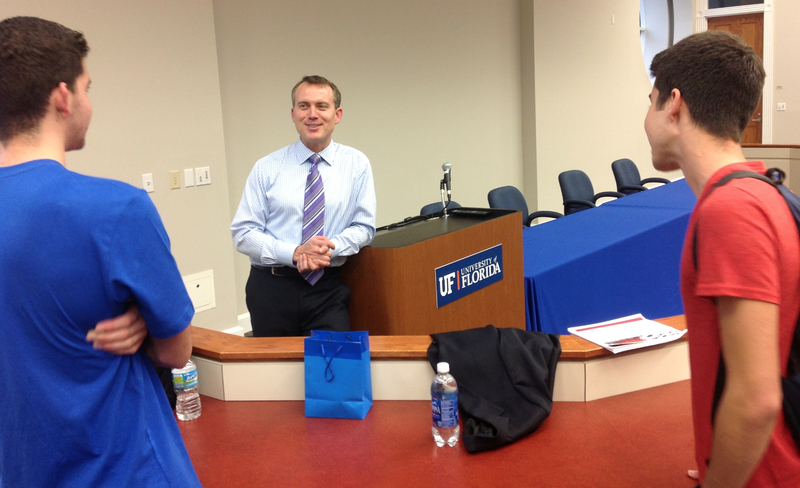 GAINESVILLE,FL: East West Manufacturing CEO Scott Ellyson (BS ISE 1993) delivered the Fall 2012 Gregory Lecture on Tuesday, December 4 in Emerson Hall. 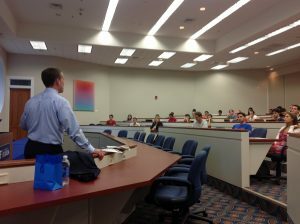 He covered a variety of topics of interest to students studying Sales Engineering, including the career steps he took up to his current position leading the “Domestic Offshore Manufacturing” firm. Upon graduation he took a process improvement specialist position with Boston Scientific and then moved to consulting with PriceWaterhouseCoopers. He then left to start ITL Ltd. with his brother, producing electronic components and assemblies in China for the auto industry. Ellyson then joined Diversitech, a manufacturer and distributor of HVAC components and supplies, as the VP of Offshore Manufacturing and Logistics. He left this position to co-found East West Manufacturing which produces over 5000 products with over 500 employees in America, China, Vietnam and India. It was recently ranked the 14th fastest growing company in Georgia. “We make products all over the world,” said Ellyson. “Our job is to make the products in the location that is best for our customers.” These products range from HVAC supplies to parts for robots being produced for automated warehouses. 1. Differentiate yourself — early. 2. Work for a world class company in your 20s so you know how to build one in your 40s. 3. Take risks, but be prepared to lose everything you risk. 4. Keep expenses low, always. 5. It is not all about you. It is about the team. 7. Distribution is almost everything. 8. It is very difficult to educate your customer. 9. Know your competition — don’t underestimate. 10. It is much easier with recurring revenue.